As a renowned organization, we are engaged in offering a wide range of pillow filling machine We are offering these products at nominal market price. Backed by vast industry experience, we, Apsara Engineers, established in 1993 are one of the leading manufacturers of Textile Machines and Spares. 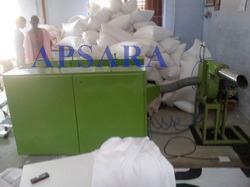 Our wide range of product includes Pillow Machines, Fibre Opening Machine and Fiber Opening Filling Machine. Offered products are highly appreciated by our customers for their cost effectiveness, durability and unmatched quality. All our products are manufactured at our state-of-the-art manufacturing unit, which is well equipped with sophisticated machines and equipment. Offered machines are manned by experienced and skilled workforce, which makes optimum use of the available resources to manufacture products conforming to the highest standards of quality. Use of high grade raw material in the manufacturing process ensures a flawless range of finished products. We constantly strive for maintaining a high level of client satisfaction by offering best quality machinery and spare parts at industry leading prices. The organization has managed to secure a very strong base of clients, who are absolutely satisfied with the quality of the products offered by us.